Here’s a quick first look at a great 4-wheel golf push cart which I’m reviewing now. 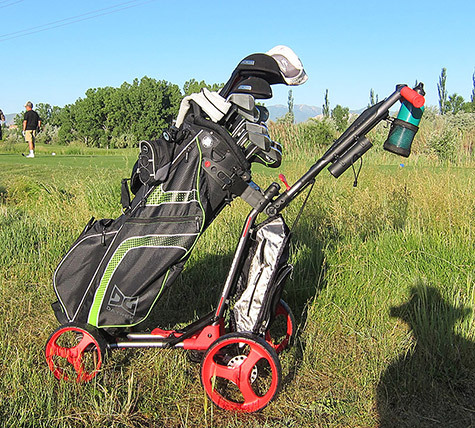 In my league this afternoon I’ll be putting my new Sun Mountain Micro-Cart Sport through round two of my evaluation. The course I’ll be trekking is a mountainside layout which features some very large elevation changes. My first impressions are that this cart is SOLID. I reviewed the original Micro-Cart a while back and this cart builds on that great foundation. I really dig the big valuables pouch which goes under the handle. The valuables holder and magnetic scorecard holder are the best design I’ve used in any push cart whether they’re two, three or four wheeled models. Stay tuned for my review. Until then check out some Micro-Cart Sport images.